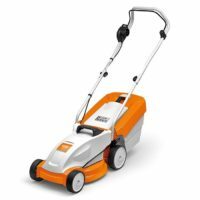 When you need to mow small, clear lawns, the low-noise STIHL RME 235 electric lawn mower is the right choice. This machine with its simple but sturdy construction is a lightweight machine which will enable you to easily maintain your lawn. The central cutting height adjustment can be adjusted in five steps to mow the grass at the optimum height. This guarantees convincing mowing results and a pure mowing pattern in your garden. The built-in bag-full indicator will let you know the when the collector is full. The folding handlebar can be adjusted in two steps in height. This compact, lightweight machine weighs in at only 13 kg so is extremely lightweight and has a practical carrying handle that allows it to be stowed away or transported in a space-saving manner. STIHL electric lawn mowers are in their element in gardens up to 800 m². They stand out because of their high reliability, easy handling and good cutting and collection capacity. Central cutting height adjustment – The central cutting height adjustment is supported by a spring so that you can easily set the desired cutting height in several stages. A scale shows the current height. Wind wing blade – The wind wing blade ensures an even cutting height and guarantees optimum filling of the grass collection box. The powerful airflow generated by the blade in the housing directs the grass for cutting and pushes it efficiently to the collection box via the built-in and powerful air conduction system. Folding grass collection box – The plastic collection box is equipped with a valve mechanism that makes it easy to open and empty. The airflow generated during mowing, leads the grass to the grass catcher for optimum filling. The air is guided sideways towards the ground when mowing via the downwardly directed slats, without any swirling dirt. The content indication indicates when the box needs to be emptied. Light running wheels – The smooth running wheels of the STIHL lawn mower are very sturdy and have a long lifespan. The tires are equipped with a profile that improves traction and directional stability, so you can effortlessly manoeuvre and keep the machine in the right track when mowing. Integrated strain relief for the cable. Integrated strain relief for the cable – With the integrated strain relief for the cable, the extension cable remains firmly attached to the combined plug / switch of the electric STIHL lawnmower. Carry handles – This STIHL lawnmower is equipped with carrying handles so that it can be easily transported and easily loaded and unloaded. The carrying handles can also be used as lashing eyes to anchor the lawnmower with a belt during transport. Folding steering rod – Thanks to the folding steering rod, you can effortlessly fold and store the STIHL lawn mower without taking up a lot of space, or take it to the next spot to be mowed. Height-adjustable push bar – The push bar can be adjusted to your body height in several steps. The individual height adjustment ensures comfortable and ergonomic operation of the STIHL lawnmower, without compromising on stability and manoeuvrability. Polymer housing – The light polymer housing has a high resistance and is very resistant to shocks, heat and UV rays.